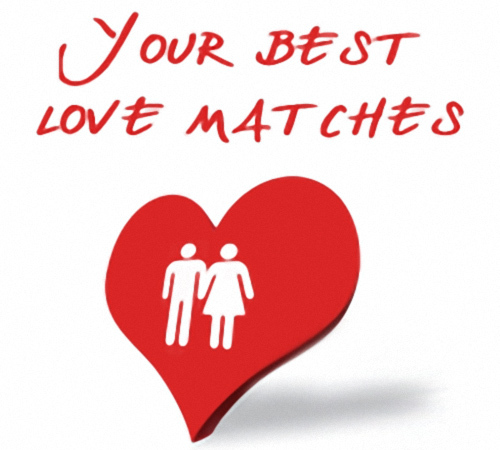 Looking For Best Zodiac Sign Love Match? Do you have the best zodiac sign love match with your partner? This is the age-old question that concerns many couples. 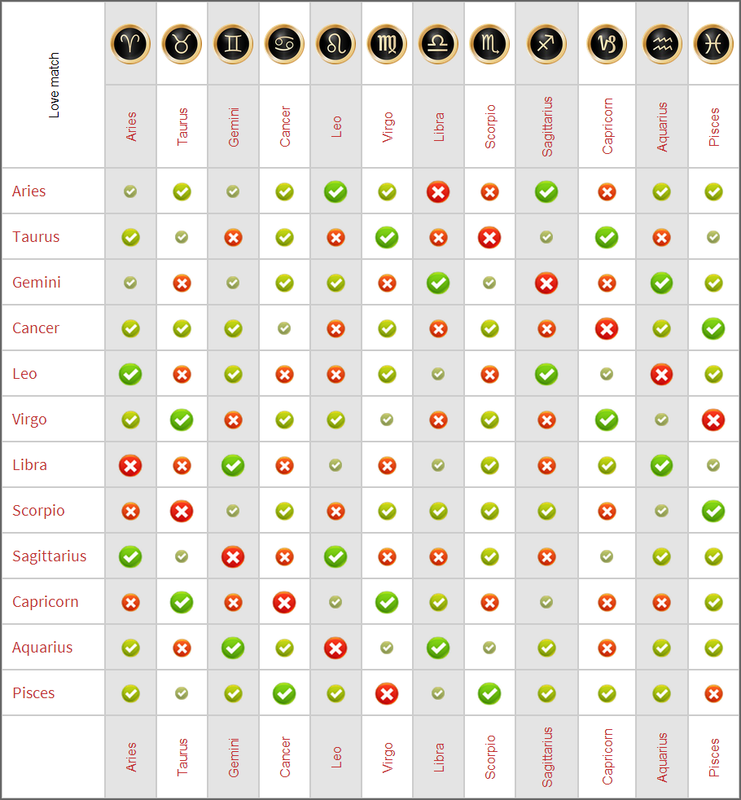 I'm sure you will study the love compatibility chart below and see, if you will be a happy love pair. Do you see a red color in the zodiac sign love match with your partner? Do not despair! Red in Horoscope Compatibility Chart – Disagreement in Love? When you meet a partner, which is not a perfect match according to the Horoscope Compatibility Chart, it may still be the love for a lifetime - as they say "opposites attract". Important is, that the nature of such two signs are different in many ways. In the manner they communicate, how they express their feelings, how to decide, how quickly they act, etc. The signs in opposition are marked with red color. The opposition brings to the relationship dynamics and special charge. While one of you can be very emotional and intuitive, the other one will rely primarily on reason and critical judgment. One can always have his head in the clouds and the other will have feet firmly on the ground. One will be full of ideas including the desire to travel, the other will appreciate the peace and home comfort. In other words, you can create a pair, that will have sometimes completely different approach. And this different approach to life can enrich each other. However, according to the experience of astrologers, opposing signs in your Horoscope Compatibility Chart will rather lead to the mutual misunderstanding. Thus, if you see a mismatch with your partner in the zodiac chart, do not give up – just beware and be prepared, that this kind of love is full of motion, adventure and constant change. Green in Horoscope Compatibility Chart – Perfect Love Match? If you can see green by your counterpart in the chart, it is a reason for joy. They say "birds of a feather flock together", which in this case means that you have a lot in common. They may be the same life priorities, interests, sense of humor, world view and way of solving problems or how you experience love. Thanks to the many common characteristics, it is likely, that your relationship will be gentle and harmonious, and that your life energy will rise in love. The Horoscope Compatibility Chart suggests, that together you will achieve more, than if you were alone. Your love will develop naturally because you're „on the same wavelength“. Without having anything to explain your partner will quickly understand, what you mean and what you seek. Your relationship will be deep and built on a solid foundation. The zodiac sign love match can bring true joy and happiness to both. Just be careful not to lose the sense of reality when you fall deeply in love. Sometimes even the best conditions are not enough to the peaceful love fulfillment. Every relationship is alive and fragile, so it continuously takes effort and patience. It is said that "Rome wasn't built in a day" and for the relationships it is doubly true. Although you can be an ideal couple by horoscope, your relationship is waiting for a long way, which brings a beautiful romantic moments, but also many difficult tests. You have to enjoy your love deeply and be prepared for difficult moments at the same time. I wish good luck to your love!